The Bermuda Tourism Authority climbed six points and moved into second on the Bermuda Top 50 Klout rankings. The BTA’s score of 80 places it just four points behind perennial leader John Layfield, the Fox business analyst and former WWE champion and current WWE commentator. The BTA’s Jamel Hardtman [#18], Alastair Jack [#25] and Victoria Isley [#34] were also on the Bermuda Klout rankings with Glenn Jones [#51] just missing this list. Three politicians made the list: Premier Michael Dunkley [#5], and MPs Jeff Sousa [#7] and Diallo Rabain [#20]. The Hamilton Princess had the greast gain of the month as it picked up 11 points to score a 71 and move into the top 10 for the first time. Other hotels include the Fairmont Southampton [#15] and Grotto Bay Resort [#20]. Chubb Insurance joined the rankings at #41, marking the first time one of Bermuda’s reinsurers has been in the top 50. All scores were recorded on January 8, 2017. 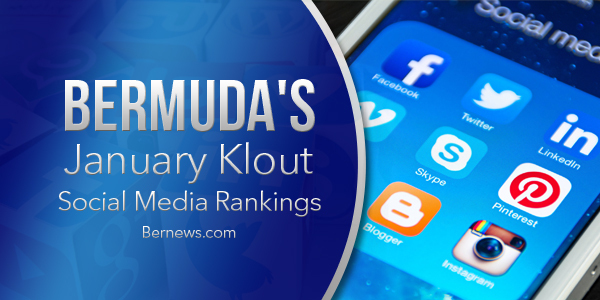 The next Bermuda Klout rankings will be published in April. If you have a Klout score of 60 or higher, have a Bermuda connection andwere not on this list, please e-mail him at dburgesspb@gmail.com or Tweet him @DonBermuda. Don Burgess is the Executive Officer of the Media Council of Bermuda and is the former deputy editor of the Bermuda Sun newspaper who has earned certifications in social media and inbound marketing through Hootsuite, HubSpot and Lern Univeristy. If you have a Twitter following of more than 3,200 and have a Bermuda connection and were not on this list, please e-mail Don Burgess at dburgesspb@gmail.com. Don’t forget to support #marriageequality in 2017.